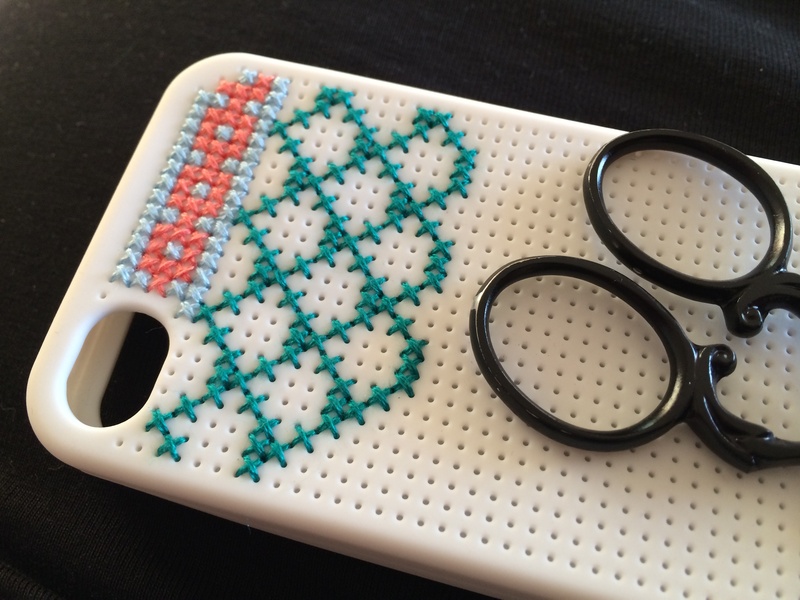 DIY Cross Stitch iPhone Case. For Christmas last year, my beloved Mama (I have literally never called her that in my life, what is going on?) 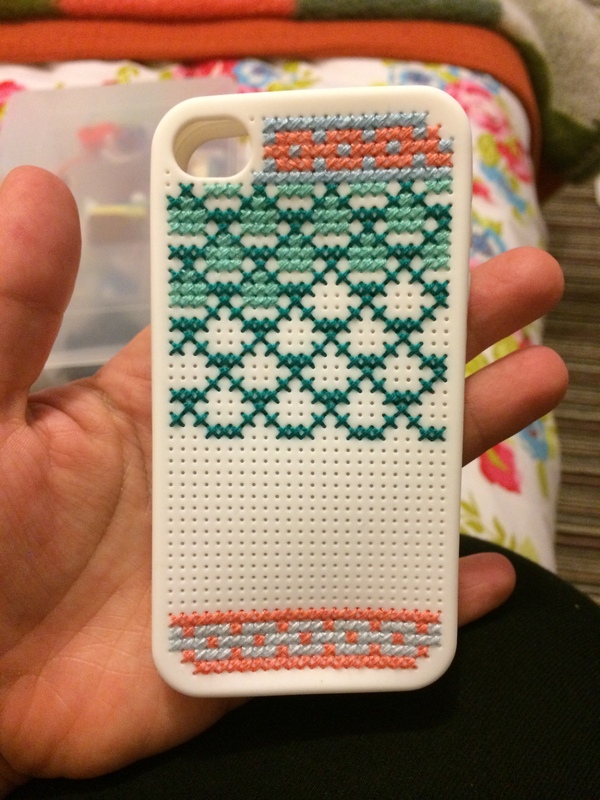 gave me a DIY cross stitch iPhone case as a stocking filler. I’d been eyeing up these things for ages so I was really excited to give it a go. Naturally that excitement gave way to my woeful predilection for procrastination, so I only got round to starting it in February. Roll on April and it’s finally finished! I’ve had quite a lot of interest in it as a project, so I thought it might be worth posting a quick review. The kit is by thumbsUp! and you can find stockists on the product page. I’ve seen a few floating about on ebay, so that might be worth checking too! 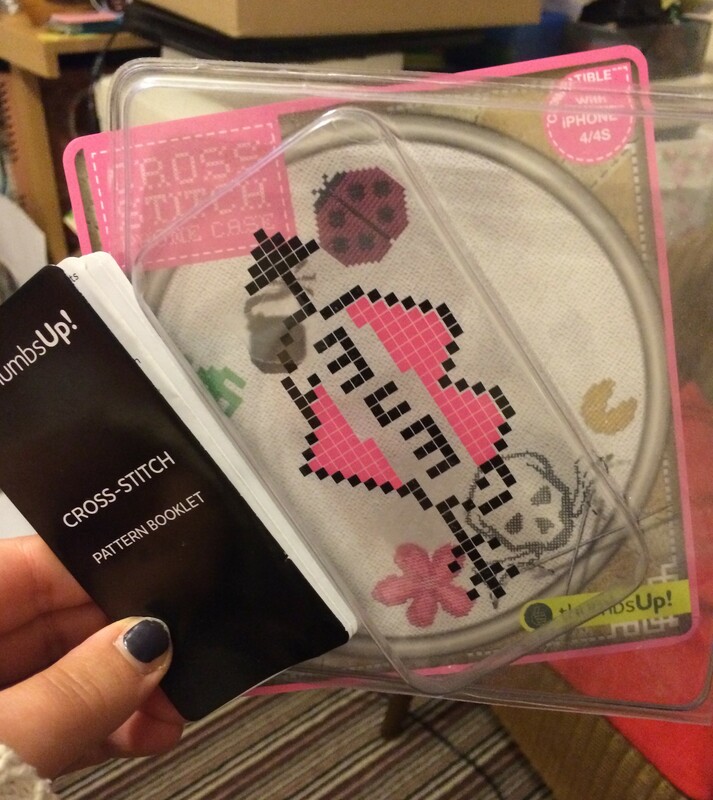 The kit contained the silicon phone case with punched holes, a needle, a needle threader, seven bobbins of thread and a booklet containing some simple cross stitch patterns that would fit the case. I quickly decided to scrap the patterns and colours, instead choosing Anchor floss from my inexhaustible stash and making up the pattern as I went along. I probably could have benefited from spending an afternoon having a proper think about the pattern and making use of some graph paper to create it. I had to do a lot of on the fly counting to try and keep the design vaguely symmetrical, and despite my best efforts it’s definitely off in places. 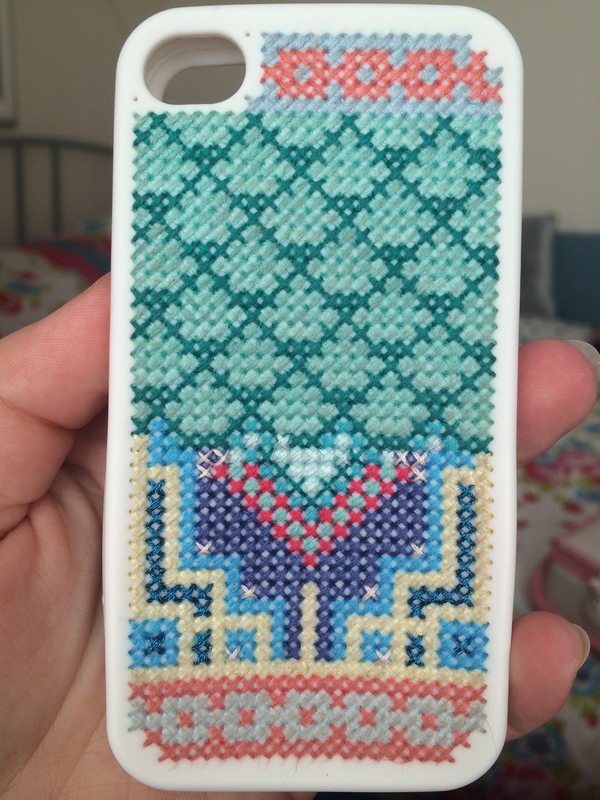 I’d say the easiest way to stitch this case is to arm yourself with a pattern! The phone case bought for me is actually for a iPhone 4s, whereas I have the 5s, so the fit is off and I wasn’t feeling precious about it, as I’m pretty sure it’ll stretch out and I’ll have to replace it with a snugger fit eventually. However, if you’ve bought the right one for yourself you might want to spend a little more time on the design and colour stage than I did! I’d seen a few geometric print cases online, and decided to mash together a few colours and designs to fashion myself the ‘Joseph’s Technicolour Dream Coat’ of protective coverings. 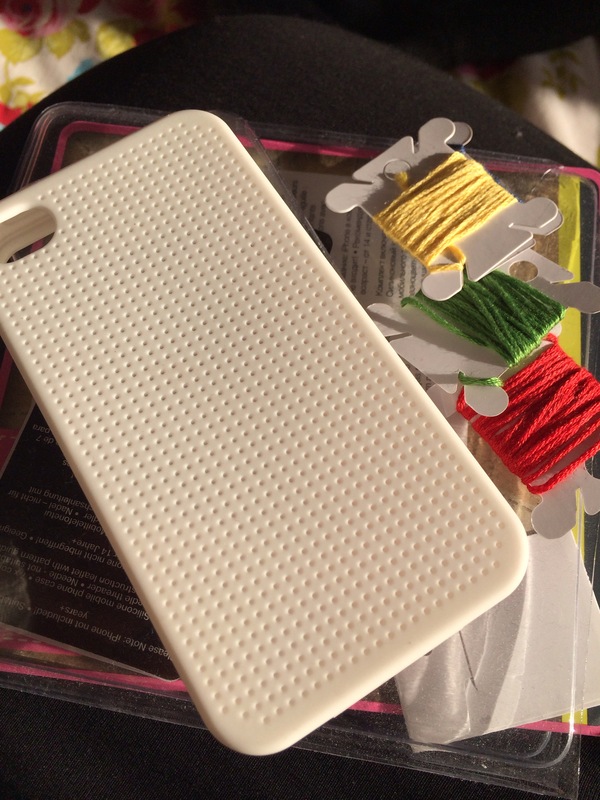 I found it really easy to get used to stitching on the case, which made the whole project a bit of a breeze. The silicon has that extra firmness that the aida fabric I’m used to doesn’t, so it was easy to get the tension of the stitches even and I could be a little rougher with my grip than usual without worrying about any dreaded creases. I managed to use a little bit of metallic thread in there (a dark blue that I have had forever and never used much of) just to see how it would work. It was pretty much as annoying as metallic thread ever is, but again the silicon gave it a bit of grip, so I didn’t have any more trouble with it than usual. Another thing I really liked was that I was able to deliberately (promise!) leave the back untidy, tucking in the tails but not worrying too much about carrying colours across to different sections. 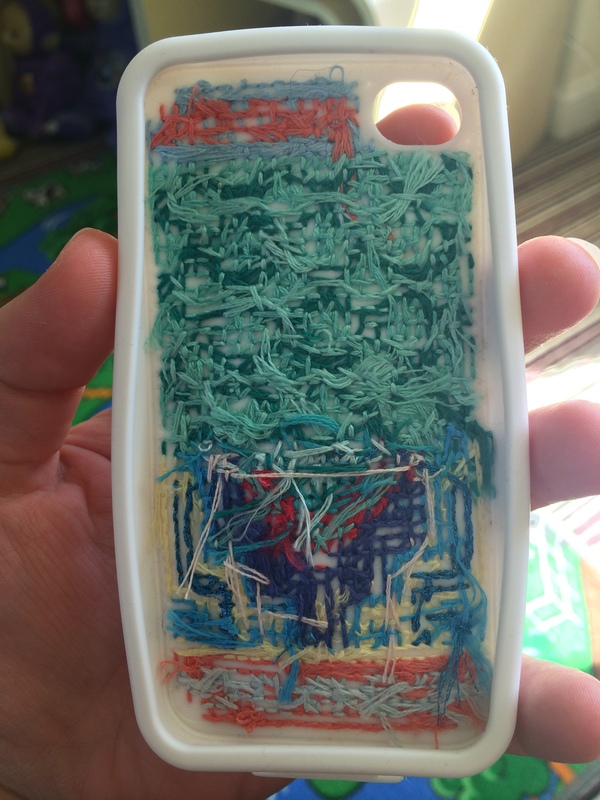 I figure the soft bulk can only serve to help keep the back of the phone protected, and that no one would ever see it anyway! It would have been a quick project if I had have sat down for one or two evenings and got on with it, but like I said, it did take me two months to get it finished due to a hell of a lot of procrastination. I completed the top half first and started using it on my phone, and it has to be said that the stitching has gotten a bit grubby from the depths of my handbag. I haven’t tried cleaning it up yet, so I’ll d0 another post about that when the newer stitches on the case are equally grimy. What I would say is that bear this in mind when choosing your colours, because naturally the lighter ones are going to show the dirt most. My bag is actually pretty empty and clean, so I’d imagine if you’re a bit of a Mary Poppins you might find the case gets dirty pretty quickly. I wasn’t completely happy with my colour choices (again, a plan would have helped! ), so I did actually unpick a section of the case, which was really easy to do! I was quite surprised that the holes kept their shape and I wouldn’t have been able to tell that the unpicked part of the case had been stitched on at all. It’s a surprisingly sturdy little thing! That’s good news if you want to change up the design every now and again! So this is what I’ve finally ended up with! Tadaaaa! 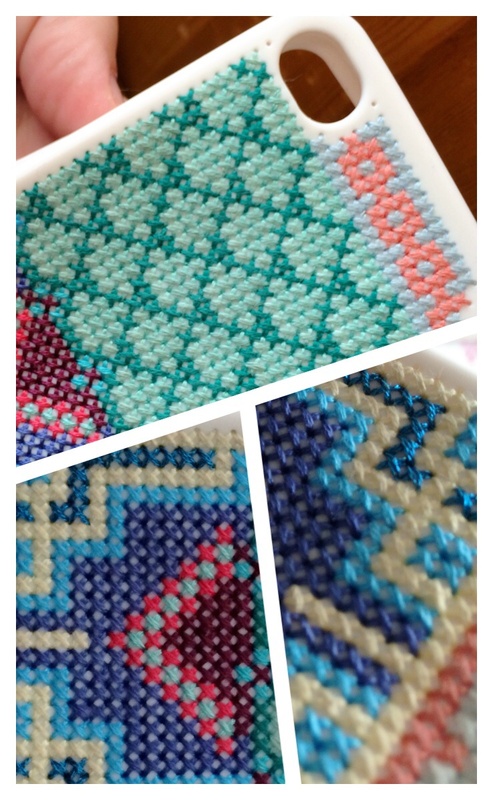 It’s not perfect, and in hindsight I’d do the pattern differently, but it was a fun and easy project that I really enjoyed messing about with. Cheers & enjoy your Easter weekend! I found it so hard to decide on a pattern, I had an iPhone 4 case that I wavered on so long that I never stitched it and got an iPhone 5S. I love how yours turned out, I didn’t love stitching on the case but I love the effect. It is tricky pattern wise, especially when the ones they provide are a tad uninspired! Thank you so much 🙂 I’ll admit it is a lot of work for something that’s inevitably going to get grubby and have to be changed!